One problem some oscillation multi-tool fans may face is the difference in blades between brands. The blades from one brands cordless multi-tool will most likely not fit your corded multi-tool from another brand, that is unless you are using some type of commercial or homemade adapter. A company called Versa-Tool is trying to end some of the confusion caused, by selling a one-blade-fits-all solution. 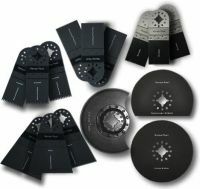 They offer a complete selection of oscillation tool blades, everything from fine cut to carbide blades, that fit a great number of oscillation tools on the market today, even ones you have never heard of. Sound great right? The problem, some of the most popular multi-tools such as the Dremel Multi-Max and the Rockwell Sonicrafter are not compatible. If you own one of the other tools listed below you should be all set. Fein Multimaster (All models including FMM250Q, 250, MSx 315 and all models featuring 3/8 inch round arbors), Bosch corded and cordless multi - x, CRAFTSMAN, Chicago Electric, Tool Mate, Power Craft, SECCO, HTC-87, EINHELL, Top Craft, Artwork, MEEC Tools, Man Power, Millarco prof, Westfalia, Falke, Ferm Zwolle Holland, Cougar, Rock Worth, B&Q, Counstructor, Duro, Work Best, Matrix, Pro-Line, Ideenshop, Driving Force, LongActive, VOSS.